Today was our foray into Old Delhi. We started by taking a taxi to the Red Fort. I thought we should hire a taxi for the day because I was worried it would be too manic, but I deferred to Jean who thought that the sites we wanted to see were in walking distance of each other and easily navigable. The Red Fort was massive, far exceeding any sites we had seen so far . The Red Fort was constructed by the Emporer Shah Jahan in 1639 and is a mile and a half long filled with palaces, government offices, and ornately carved columns and structures. After 1857 it was the headquarters of the British Indian army and is amazingly expansive and beautiful. It struck me to see 17th century scales of justice carved into the walls--a tribute to the sophistication of the Mughal legal system. Of course, young Indian men and couples kept asking to take pictures with us. Apparently, it's fairly common for young men to show off their "good friends" and "girlfriends" from America. We walked through the marketplaces of Old Delhi barraged by sights and sounds heading to an establishment called Kareem's for lunch. The sheer human traffic was so dense that my senses were assailed just trying to navigate without falling. People approached hawking their wares insistently, others stared at us standing out so starkly in the ocean of brown bodies. All this while dodging motorcycles, auto rickshaws, cow dung, and other dogs, cows, and monkeys careening through the streets. Karim's restaurant dates back to 1913 when it was opened by a chef who reputedly hailed from a family of royal cooks that served the Mughal emporor Akbar. Well known for its amazing food among locals and tourists alike, the place itself is a delightful little hole in the wall -- dirty and crowded with a variety of colliding smells. We ordered mutton qorma, chicken biryani, seekh kabob, and aloo palak with butter and plain nan. It was all delicious, but the standout was the seekh kabob, served tender and dripping with spices. Indian men sat all around us eating together, not speaking, dipping their nan into their mutton curries contentedly. After, we walked across the street to Jama Masdid, one of the largest mosques in the world built by the Mughal Emperor Shah Jahan in 1656 capable of housing 10,000 worshippers. E.M. Forster called the mosque one of the most noble structures in all of India. After removing our shoes, Jean and I went in separately, there being some confusion about whether we were allowed to go in with cameras. Children played cricket outside, bouncing the ball against the walls giant mosque as Muslims prayed inside among the lovely stone structures. One of the amazing sounds of Delhi is the call to prayer that echos through the streets during the day. I walked along the high walls appreciating the detailed stone carvings and the penitence of its many worshipers. I prepared to climb one of the minaret towers for the better view of the city when a German girl approached. "Excuse me, but are you going up in the tower?" "Yes, I thought I would." "Would you mind escorting me? They don't allow women up there." I gave her my arm in mock graciousness and she smiled broadly as we ascended the tower. Inga was a lovely German girl who had moved to Delhi a few months ago (and then a small city north) to perform sustainable economic development here. She seemed amazingly carefree, especially amidst the stark poverty of Delhi, but I found myself only half listening to her as the dark stairs spiraled up narrowly over five stories so tightly that people coming down could barely squeeze past. I could only imagine the secret thrills people must have brushing past Inga as I felt limbs and bodies smashed into my own. Fighting claustrophobia and trying to make pleasant conversation, we finally emerged at the top, the view being compltely worth the panic I had staved off. At the top of the tower were the most exquisite views of Old Delhi and the Red Fort. I could see the dark dirty houses smashed on top of one another and the black sooty streets filled with people exploding with color. It was truly breathtaking and as I clung to the seemingly frail stone railing with one hand attempting not to plunge back down the stairs or down the tower, Inga nonchalantly asked me to take some pictures of her with her camera, promising to send me all the pictures since I didn't have my camera. Clinging awkwardly to the railing I hurriedly snapped photos of Inga and the surroudings. A group of Indian men staring seriously at the tall blonde German reminded me why women were not allowed to ascend the tower alone. As we exited the tower and some more pleasant conversation, it was decided that Inga would accompany us through Old Delhi. I went to locate Jean and Inga went to locate her shoes. I felt a little awkward telling Jean we had a new travelling companion (just another day of picking up hot German girls at the local mosque), but she seemed to entranced by the young men playing cricket to care too much. We decided to walk Chandni Chowk, a street market which hosts a spice market filled with every exotic Eastern spice imaginable. The smell alone is reported to make passeersby woozy. Luckily, Inga had a car which alleviated the burden of navigating the crowds. Relieved, we climbed into her car and plunged through the crowds of Old Delhi honking and weaving. It's huge and quiet and cool. You're not allowed to speak inside. 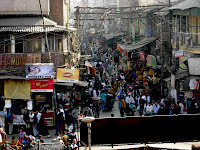 Second, go to Dilli Haat, a market ("haat") that's also called "Craft Village". You pay a few cents to get in, which means that once you're in there's no beggars. If you're into shopping, it's a little pricey, but the best quality and lowest stress anywhere in the city. An excellent food court with dozens of stalls. It's like an earthy, classy Indian mall, and if you're serious about buying anything authentic or beautiful, or you just want a quiet afternoon or evening, this is the place. Have fun! Keep the posts coming!